Michael J. Mauboussin is known throughout the financial world for his innovative approach to succeeding on Wall Street. His unconventional methods have earned him a place on Smart Money's list of the "Most Influential People on Wall Street" and in the Wall Street Journal's All-Star survey. In More Than You Know, Mauboussin shares his secret to becoming an insightful investor and provides invaluable tools to better understand the concepts of choice and risk. Mauboussin develops sound investment strategies by drawing on diverse sources and disciplines. He builds on the ideas of sage yet diverse visionaries, including Warren Buffett and E.O. Wilson, but he also finds wisdom in a range of activities and fields that is both broad and deep, including casino gambling, horse racing, psychology, and evolutionary biology. He analyzes the strategies of poker experts David Sklansky and Puggy Pearson and pinpoints parallels between mate selection in guppies and stock market booms. Ant colonies, Tupperware parties, "hot hands" in basketball, slime mold, and Tiger Woods's swing all have something to tell us about smart investing. More Than You Know is written with the professional investor in mind but extends far beyond the world of economics and finance. Mauboussin breaks the book into four sections: Investment Philosophy, Psychology of Investing, Innovation and Competitive Strategy, and Science and Complexity Theory. And he includes useful references for further reading on the topics he discusses. 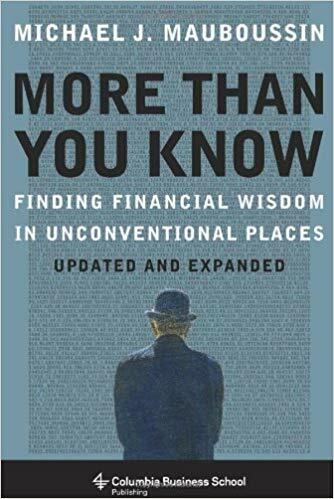 A true eye-opener, More Than You Know shows how a multidisciplinary approach that pays close attention to process and the psychology of decision making offers the best chance for long-term financial results.